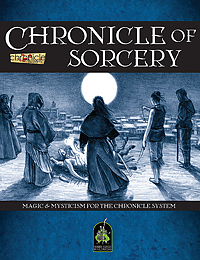 Today we present Chronicle of Sorcery, now available for sale in our Green Ronin Online Store. When darkest sorcery and the mysteries of magic are laid bare, such power will shake the lands themselves. Chronicle of Sorcery is a supplement that details the core mechanics for magical power into any game powered by the Chronicle System, providing the foundation for entire systems of sorcerous might. Includes the basic Sorcery mechanics, new Benefits and Drawbacks, Common Sorceries, and new Holdings for the Houses with magic at their disposal. Chronicle of Sorcery is for use with the Chronicle System engine that powers our popular A Song of Ice & Fire Roleplaying game. Now Pre-Ordering: The Advanced Bestiary for the Pathfinder RPG Ronin Round Table: The Food Trucks of Freedom!